Matthew Wade had the weight of four centuries in a year when he was first called up to the Australian team in 2011. The year 2015 has been similarly kind: he scored his third ton in seven months and has made it back to international cricket. 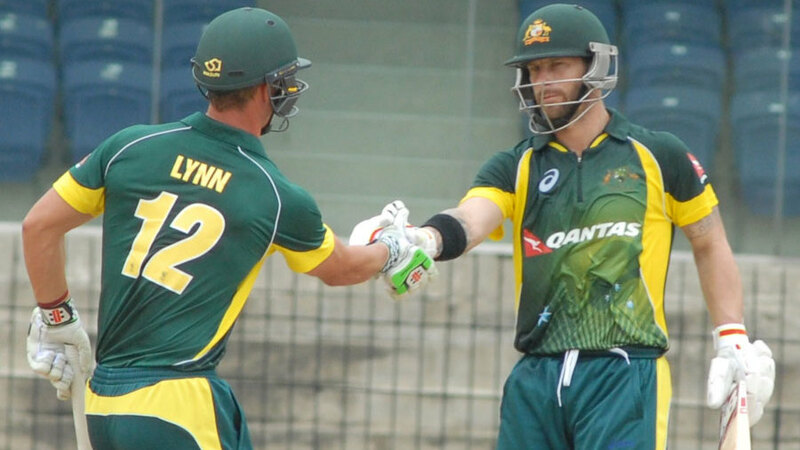 His stroke-filled 130 off 106 balls set up a 108-run victory over South Africa A and ensured Australia A maintained a perfect record going into the final of the A-team tri-series in Chennai. The defeat meant that South Africa A were still not on the board after three matches, and they now need to secure a bonus-point win against India A tomorrow to stand any chance of qualifying for the final. Wade had been named captain in place of the rested Usman Khawaja. He called correctly at the toss, chose to bat and had to come out at No. 3 in the very first over. His first scoring shot was a six, helped of course by the fact that it was a free hit. His second and third hits were fours, and he was on his way. Wade's bottom-handed strength was on show, the sweep shot being utilised frequently and effectively. Wade hit seven sixes and nine fours - 78 of his 130 runs - and that meant South Africa A muting the rest of the top five amounted to very little. He had 50 off 45 balls; his team had 78 on the board. His hundred came off 90 balls; his team had 158 on the board. The numbers give a clear indication of how the rest of the top-five fared: Chris Lynn's 29 was the next best contribution. So long as Wade was at the crease, South Africa A were never allowed the upper hand. He was gracious enough to pop a catch to square leg on 26, but Beuran Hendricks had overstepped and the cost of that mistake kept growing. The game held little consequence for Australia A. Seven of their numbers will take the field in Chennai on Friday morning for the tri-series final, and then leave for London later at night no matter what had happened today. So giving Wade some batting practice considering he is the only specialist wicketkeeper chosen in the Australian ODI team was sensible: His scores on this tour before today had been 5, 34*, 11 and 2. "We had a chat with selectors, Trevor Hohns is here, and the coaches had a chat before," Wade said. "They let me know I was going to captain and they wanted me to just go up and have a hit. We'd already qualified for the final so that'll go back to normal, I'm guessing. Usman will come out and bat at the top and I'll probably slip down to No. 6." The impact of having a set batsman at the crease became clear in South Africa A's chase. Only Dean Elgar with 64 off 85 balls and Khaya Zondo with 47 not out off 49 offered any resistance. The rest of the batsmen struggled for timing, and were outclassed by the Australian bowlers, as five single-digit scores would suggest. Nathan Coulter-Nile, who is among those headed to England, produced a brilliant spell of 7-1-8-2. The only runs scored off him were singles and the wickets he took were off back-to-back deliveries: He bounced Cameron Delport out on a slow pitch and sent Theunis de Bryun's stumps crashing with an indipper. The hat-trick ball took Elgar's edge, but it fell short of the slips. Technically, it can be said that he'd created four chances in four balls: the one prior to Delport's wicket took Reeza Hendricks' outside edge but was shelled at second slip by a diving Lynn. The new ball left South Africa A at 37 for 3 and as it got older, spinners Ashton Agar and Cameron Boyce took control. They shared six wickets between them as the score slumped from 142 for 4 to 148 for 8. Defeat came not long after. There is an argument that South Africa A have not been able to put their best XI on the park. Quinton de Kock and Wayne Parnell were still recuperating from the stomach bug that had "ravaged" the team a few days ago. Lonwabo Tsotsobe, at the post-match press conference, would not confirm the source of the illness but did mention that de Kock and Parnell had been advised rest by the doctors. "We had food at the Hard Rock and then we had food at the hotel. So you can't really say which one it was," Tsotsobe said. "Those were the orders from the doctor and you can't do anything if the doctor tells you to rest. But like I said earlier, it's [picking the XI] up to the coaches and we'll see tomorrow."